Hello! We were given my parents 27 ft round above ground pool, we have purchased a new liner (going from j-bead to an overlap). Last year we attempted to install 4 times and failed miserably due to "too many cooks in the kitchen" this year we have hired someone to re-dig the ground 30ft round & 6-8inches deep so we know it's done properly and is level. One problem we ran into last year was our brick pavers for the uprights always seemed off a tiny bit which would lead to the pool being slightly off round, one side caving in or out or not lining up seamlessly. Is there a recommended measurement from the center of the pool to where the paver blocks should sit for a 27ft round? Also what is the easiest way to set the pavers in the ground, I'm worried once we start to dig out ground for them to fit flush in it may create the leveled ground to become unleveled. When installing the overlap liner should we tape along the entire top of the metal wall of the pool to prevent risk of tearing? Hi There is no exact measurement for setting the bottom rail or the blocks. The bottom rail needs to be perfectly round. 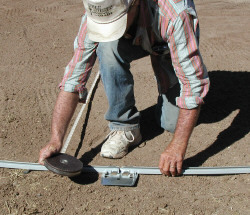 Use a tape measure off a center point and lay the bottom rail out with a 13' 6" radius. Get this part right before starting with the blocks. Once the bottom rail is round the blocks are then centered under each footplate. variable in this method. 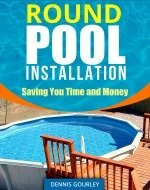 The pool radius could vary by a few inches. There is normally a small gap where the bottom rails meet. This gap varies from pool to pool. When the pool wall is up and connected the gap should be the same at every footplate. It is not uncommon to install a wall and then roll it all back up just to adjust the gap. Normally this gap adjustment is not enough to take the footplates off the blocks. In your situation, having attempted the installation a few times, I assume you have a good idea for the ideal rail gap and the correct bottom rail radius. Start with that and set a block under each rail. One person can hold the rail up while another digs the hole and sets the block. You must set each block at exactly the same level. A laser level is the best way to achieve this. Once a couple blocks are set the ground in between them can be leveled and dirt packed back in around the block. In the end each plate will rest on a level paver and the bottom rails will all be sitting on firm level ground. This page can be used for a little more detail. There were no blocks under this pool, as we seldom use them, but at the point we were leveling the footplates we would have been leveling the blocks. I don't tape the top of the wall. If for any reason there is something out of the normal it gets flattened with a pair of pliers.